Automotive brake tubing is made of rolled steel, and over time, rust forms on both the inside and outside, eventually leading to brake failure. Replacing brake lines is recommended for any 40+ year old vehicle, and is essential for driving your old car safely. 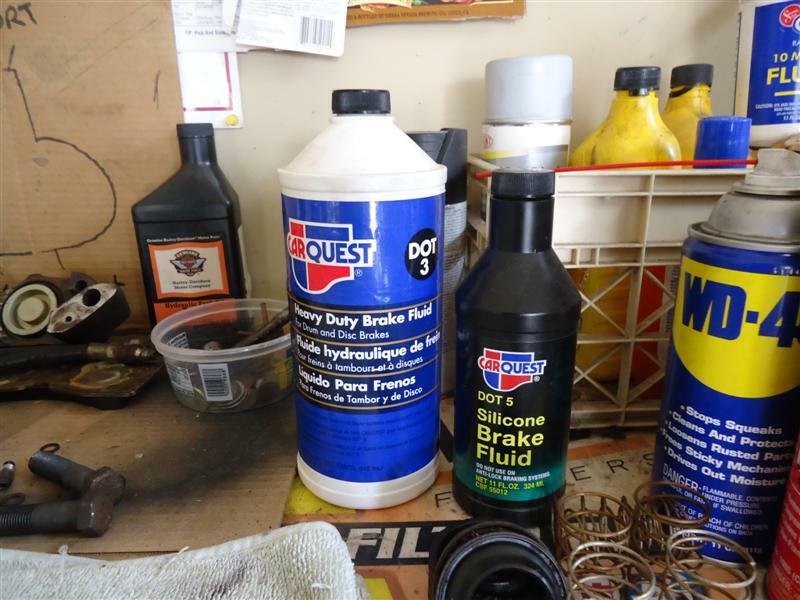 For the DIYer, learning how to make brake lines for your classic car or truck will save you $$ on your overall restoration. For two reasons, ordinary steel tubing is not safe for automotive use. First, it's only made of single-wall construction and second, there is no inner or outer corrosion protection. On the other hand, brake lines made for automotive use are manufactured from soft-steel sheets, coated with copper, and rolled over into a double-wall tube. They are then bonded at a high temperature and tin-plated to resist corrosion. Think about it, if car manufacturers could safely use cheaper tubing, wouldn't they? The two common brake line diameter sizes are 3/16" and 1/4". Most auto parts stores sell brake lines in standard lengths of 8", 12", 20", 30", 40", 50, and 60". Sometimes you'll find it offered in 72". These have pre-made flares on each end with attached line nuts. Some stores offer steel line in 25-foot rolls. You can also order these from places like Summit Racing. Unrolling is easily done by rolling the tubing out across the floor, then straightening it as you need it. If you're buying a roll of steel line, remember you'll also need to buy line-nuts. Look closely at the fittings on the end of your brake line - there are several different types. None of them are interchangeable, although adapters are made. The most common is the SAE/double (inverted/45degree) flare, followed by the DIN/ISO bubble flare. Flare refers to the end of the brake line tubing, most American and some import cars use the SAE style. To make a double flare end, the flare is folded above itself, creating a double and secure flare. Be aware that a single flare is not strong enough to hold the pressure of a hydraulic automotive brake system. Fittings called AN (Army-Navy) require 37-degree single flares, but are completely different than automotive. Old Volkswagens and other European cars have an "DIN-flare" or "bubble flare" brake line end. These are also called an "Iso-flare". 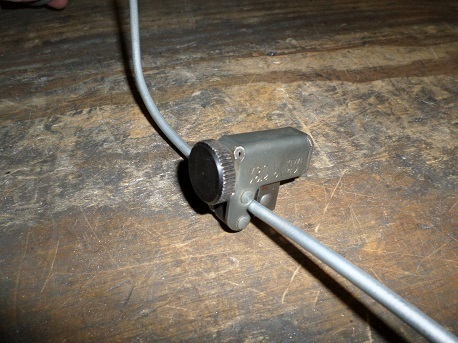 The brake line tube is compressed back on itself with most of the excess material winding up on the forward side of the flare, and the back side is formed nearly into a right angle to the tube. Not all flaring tools can make these, so bubble flares are best formed using hydraulic flaring kits. Make sure you have the proper size and style of brake line. 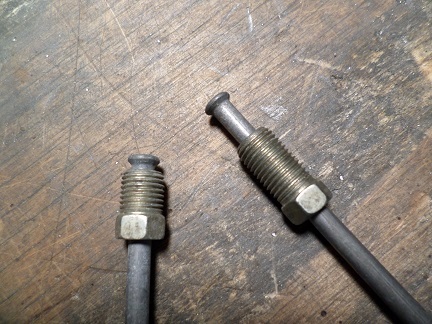 Most European cars brake line fittings are metric, and not all are the same. While restoring my old Fiat Spider, I found the bubble-flared ends were an odd metric size (10mm x 1.25). The common size is 10mm x 1.00. 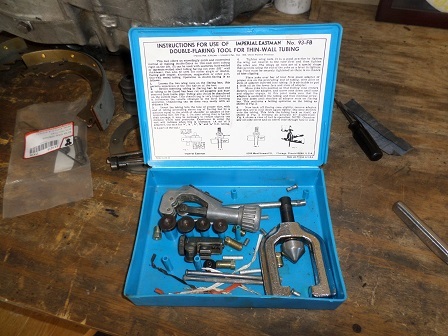 Making your own brake lines requires a few specialty tools, most importantly a flaring tool, of which there are three common types. All should come with several dies to accommodate different size lines. The simple wing-nut style double flaring tool is the most common. It mounts in a vice and sells for about $30 to $50. The second type is the leveraged manual flaring tool, which uses dies and a swing-arm to press the flares into the line. This works faster and easier than the basic flaring tool, but unless you plan on making dozens of flared lines, the 200+ dollar price tag is not feasible. Last is the hydraulically-operated flaring tool, which also saves time and effort. Instead of using a turn-screw to flare the tubing, it uses hydraulic pressure, which is faster and requires less hand strength. These hydraulically-operated flaring tools sell for about $350 and up. All three styles of flaring tools produce the same result. The more expensive hydraulic tools clamp the line in a way that avoids marking the steel line. If you don't like the shiny tooling marks left from the wing-nut style double flaring tool, you can wire-brush the raised metal on the sides of the line. Just make sure not to remove too much metal. Unless your brake lines are completely missing, you can duplicate them very closely to the factory ones. 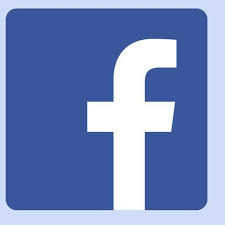 When you remove the line, try to preserve its original shape. Determine how long a piece of stock you'll need to work with a piece of string taped at the bends. Leave a little extra at both ends to be flared. Fabricate everything on your workbench. The first step is to cut the brake line to size. With the cut marked on the tube, set the pipe cutter in place and tighten it down snug (do not over-tighten). Small tubing cutters work best. Spin it once around the tube, then tighten the knob just a touch. Repeat this until the tube is cut. Most American-made vehicles use brake lines with a double flare. To make this type of end, the line is flared out, then folded back onto itself. 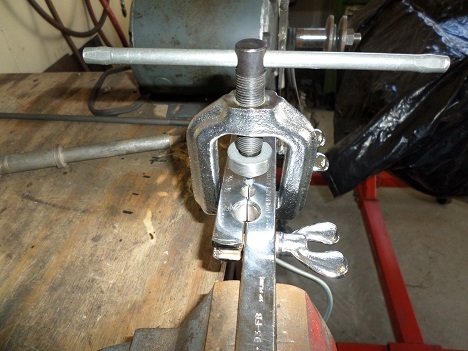 The following procedure was done with 3/16" steel brake line on a wing-nut type flaring tool. 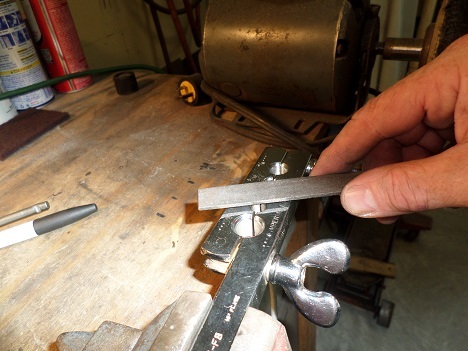 Place the forming bar in the vice and crank it down tightly, so it won't slip. Tighten the wing nut closest to the line first. Then do the nut at the far end. You'll get more leverage and won't need to use a set of pliers to finish the job. Always fit the line nuts before putting the brake line in the flaring tool. You don't want to accidentally flare a line without having the nut in place. Also, make sure the nut is facing the right way. The first step is to set the line into the flaring tool with the appropriate amount of overlay. Make sure the end of the line is clean and smooth. File flat if necessary, and chamfer the edges. These steps help ensure you make the best possible flare. The black double flare bit specifies how much the stock should stick out from the flaring tool. 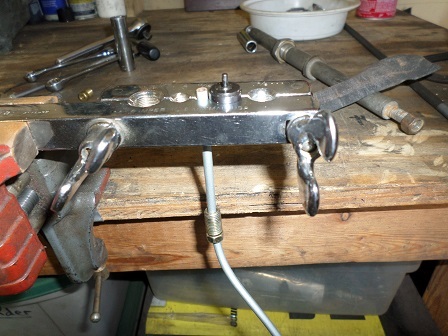 Clamp the brake line into the base, making it flush with the step on the die. Insert the double flare die into the brake line with the stub sitting down into the line. This ensures the die doesn't move during the process. Slowly turn the top handle clockwise and watch as the flare forms onto the line. Don’t crank too hard on it or you can damage the flare. Lubricating the die tip with a little brake fluid helps. Lubricating the threads of the press screw with oil reduces the force needed to turn the screw and tighten the clamping. Once the first part of the flare is made, remove the die to finish the double flare. Take the press and tighten it over the flare. With this second flare completed, the double flaring process is complete. Remove the flared line from the flaring tool. Repeat the process for the other side of the brake line, then fit the brake line onto the vehicle. Use a flare nut wrench, also called a line wrench, to minimize damage to the nut when tightening. You may have to adjust the line slightly before final tightening. Be careful when bending steel brake line, it may kink if bent by hand. Best to use a tubing bender or socket to make any curves. Always take a gradual, smooth approach while bending. Brake lines and fittings require only a flared surface to seal. If your new line is leaking, check that the brake line fitting is the right one and that the flare is not cracked or deformed. A small dab of red or green Permatex or Loctite thread sealer on the fitting is OK, but do not use teflon tape on brake line fittings. Teflon tape is for pipe threads, not for flared fittings. Stainless steel can be used for brake and fuel line, but it is more costly and more difficult to bend. Ordinary steel brake line from the parts store will last for 20+ years, just like your original line did. If your car is garaged and only used in nice weather, they'll last even longer than that. 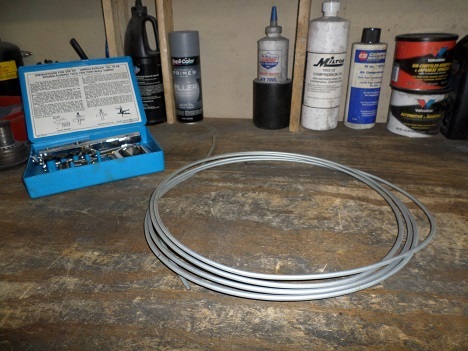 Whether you choose steel or stainless steel, the process of how to make brake lines is the same. If you are looking to repair an existing brake line, don't be tempted to use a compression fitting to splice the line together. Not only is it dangerous, it's also illegal (will not pass a safety inspection). Replace the longest brake lines first. This way, if you mess up a flare, you can cut the line and use it somewhere else. When buying a steel brake line, get one that is at least as long as you need; you can cut off one end, flare the other end to size, and still have a piece left over. Getting a good flare with simple tools requires practice and knowing what to look for. Practice making a few on smaller scrap pieces before attempting the actual repair. If the line you need measures exactly one of the available sizes you can save yourself a little work, but chances are the pre-made lines will be too long or too short. 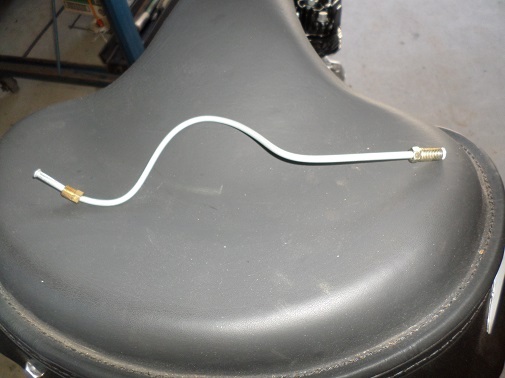 Never Use Copper For Brake Lines - It is soft and prone to cracking.